A body of solar system consisting of dust and ice can be identified as Comet. Comets are thought to be made of dust, ice (water, ammonia, methane, carbon dioxide), some organic materials and a rocky center. As a comet gets closer to the sun, the ice on the surface of the nucleus begins turning into gas, forming a cloud known as the coma. Radiation from the sun pushes dust particles away from the coma, forming a dust tail, while charged particles from the sun convert some of the comet's gases into ions, forming an ion tail. Since comet tails are shaped by sunlight and the solar wind, they always point away from the sun. Halley&apos;s comet Halley's comet is arguably the most famous comet. It is a "periodic" comet and returns to Earth's vicinity about every 75 years, making it possible for a human to see it twice in his or her lifetime. These comets are remnants left over from the formation of stars and planets, billions of years ago and are referred to as “dirty snowballs”. Comets orbit the sun, but most are believed to inhabit in an area known as the Oort Cloud, far beyond the orbit of Pluto. A comet occasionally streaks through the inner solar system and when a comet&apos;s orbit brings it close to the sun, it heats up and spews dust and gases into a giant glowing head larger than most planets. 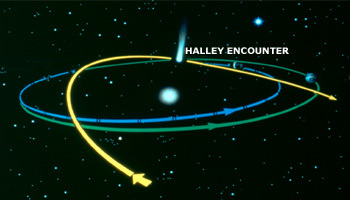 Comets can have short period orbits (less than 200 years such as Halley&apos;s comet ) or long period orbits (greater than 200 years such as comet Hale–Bopp). Some comets, however may move out of the solar system and roam freely in the interstellar space. It is thought that most comets originate in a vast cloud of ice and dust that surrounds the Solar System. 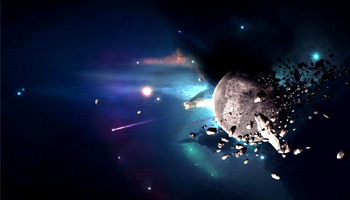 Modern theories suggest that the formation of comets occurred during the formation of the solar system. 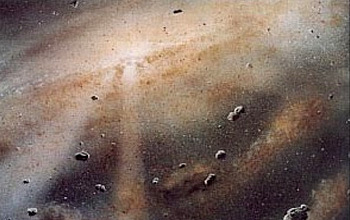 Comets may have been the first solids to condense out of the solar nebula 4.5 billion years ago at the birth of the solar system. These comets are the left overs of the formation of stars and planets and are thought to be made from the earliest materials of the solar system. When the sun first formed, it blew gases and dust out into space and some of this material condensed to form the planets and some remains in orbit far from the sun. Space debris More than 500,000 pieces of debris, or “space junk,” are tracked as they orbit the Earth. 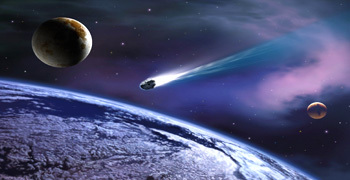 The rising population of space debris increases the potential danger to all space vehicles. The heat of Sun is so feeble beyond the Jupiter that the debris left over from the formation of the Solar system can exist in the form of icy lumps. These icebergs sometimes get into orbits close to the Sun, where some of the ice evaporates to form a long tail which shines by reflected light and we call them comets. When the comet leaves the inner solar system, the heat from Sun wanes away and as result the tail fades away leaving behind the icy lump once again. The ultimate origin is a spherical cloud of icebergs at a distance of about two light years from Sun which is nearly half&dash;way to the nearest star. They may have been there for billions of years and occasionally the gravitational force from a passing star may send some of these ice lumps into inner solar system. It may take millions of years in their journey towards Sun and then later heading back into inter stellar space. Some of these visitors are captured by the gravity of Jupiter into elongated orbits with repeated passes by the Sun. The Kuiper Belt The Kuiper Belt is a region of space in our solar system, shaped more like an ellipse than a circle, which is similar to an asteroid belt. (i) Oort Cloud – a sphere about 50,000 AUs from the sun; named after the Dutch astronomer Jan Oort who proposed it. 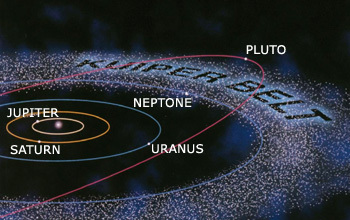 (ii) Kuiper Belt – an area within the plane of the solar system but outside the orbit of Pluto. Most of the comets that we observe belong to Kuiper belt at a distance of 2 light years. This belt of comets would extend from 30 AU to 50 AU. If a passing star exerts enough gravity on the comet, it would be set free from its path and the new path would throw it out of the solar system. Comets striking the Earth Comets contain dust, ice, carbon dioxide, ammonia, methane and more. Some researchers think comets might have originally brought some of the water and organic molecules to Earth that now make up life here. When comets pass through the inner solar system, they are captured by the gravity of Jupiter to make repeated passes by the Sun like the Halley&apos;s comet, every few decades or centuries before they evaporate entirely leaving odd lumps of rock, grit and dust scattered along their orbits. When the earth passes through such a comet trail, the sky is lit up by the bright streaks of meteors, each one caused by a piece of cosmic dust burning up in the atmosphere. If a comet nucleus strikes the earth it can cause as much damage as an asteroid or even more as it is likely to be travelling faster with more kinetic energy as it is coming from a much far off distance. 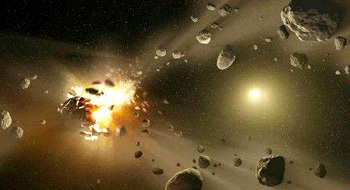 The impact that caused the death of Dinosaurs may be due to comet and not an asteroid. On March 12, 2013, the brightest comet in several years, Comet Panstarrs, was visible with naked eyes in the evening after sunset. It passed by the Sun at a distance of 0.3 AU. 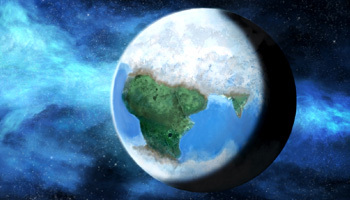 Ice age on Earth An ice age, or more precisely, a glacial age, is a period of long-term reduction in the temperature of the Earth's surface and atmosphere, resulting in the presence or expansion of continental and polar ice sheets and alpine glaciers. The comets spend billions of years in the Kuiper Belt or Oort Cloud before they crash into each other and change direction. When another star passes by the solar system, its gravity pushes the Oort cloud and/or Kuiper belt and causes some comets to descend toward the sun in a highly elliptical orbit with the sun at one focus of the ellipse as their new path brings them into the inner Solar System. As the comets move towards the Sun, they evaporate and spread fine dust enough to attenuate the the amount of heat reaching from Sun to Earth. This may trigger ice age on Earth. A passing star may cause one of the big ice lumps in the Oort Cloud to move into the inner solar system which in turn may break up near the Sun and cause an ice age millions of years later. It is speculative and we never know what could happen in future or what is in store for us depending on what happened long time back. The nucleus is the main part of the comet that is comprised of frozen gases, ice, rocks and dust. The coma is a cloud of gases that surrounds the nucleus of a comet. In some comets, a cloud of hydrogen gas surrounds the coma. Nucleus: The solid central part of the comet is known as nucleus, consisting of rock, dust and frozen gases which is usually 1 to 10 kilometers in diameter, but can be as big as 100 kilometers. Coma: The coma is a halo of evaporated gas (water vapor, ammonia, carbon dioxide) and dust that surrounds the nucleus. The coma is made as the comet warms up and is often 1,000 times larger than the nucleus. It can even become as big as Jupiter or Saturn (100,000 kilometers). The coma and nucleus together form the head of the comet. Hydrogen cloud: Every comet that is active, would be surrounded by dense neutral hydrogen atoms. As the Sun splits the water vapor molecules with UV radiation, the hydrogen gas gets released after breaking into oxygen and hydrogen. The hydrogen cloud has an irregular shape as it is distorted by the solar wind and it gets bigger as the comet approaches the sun. This hydrogen cloud may be as big as 3 million kilometers (about 2 million miles) across. Comet&apos;s pieces As comets pass through the inner solar system, they can be broken into pieces by Jupiter's gravity. 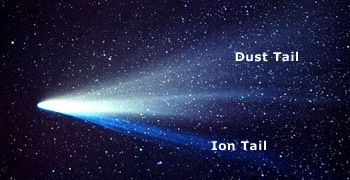 Dust tail: A dust tail would get illuminated by Sunlight, as the comet passes through the solar system. The comet&apos;s dust tail is made of small (one micron) dust particles that have evaporated from the nucleus and are pushed away from the comet by the pressure of sunlight. The dust tail is the easiest part of the comet to see because it reflects sunlight and extends to several million kilometers. 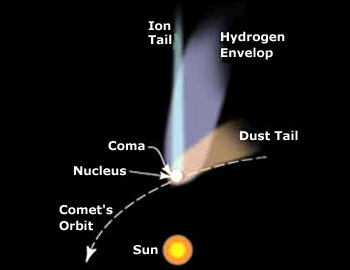 The dust tail is often curved because the comet is moving in its orbit at the same speed that the dust is moving away. Ion tail /Gas tail: The ion tail of the comet is deep blue in color, directing away from the Sun. These tails extend up to millions of miles, with the longest observed as one astronomical unit (AU). The average dynamic life of a comet is half million years. As they travel through space, they loose large amount of mass since they leave dust and ion tails along their path. These comets are under the gravitational control of the planets. Hence there is a chance that they get absorbed into the Sun or any of the planet and they may also get ejected from the solar system. As comets pass through the inner solar system, they can be broken into pieces by Jupiter&apos;s gravity. Comet Shoemaker–Levy 9 was broken into 20 pieces, each of which collided with Jupiter in one of the most spectacular examples of interplanetary impacts in recorded history. Recently, comet LINEAR was also broken into fragments by the sun's gravity as it passed the Sun.